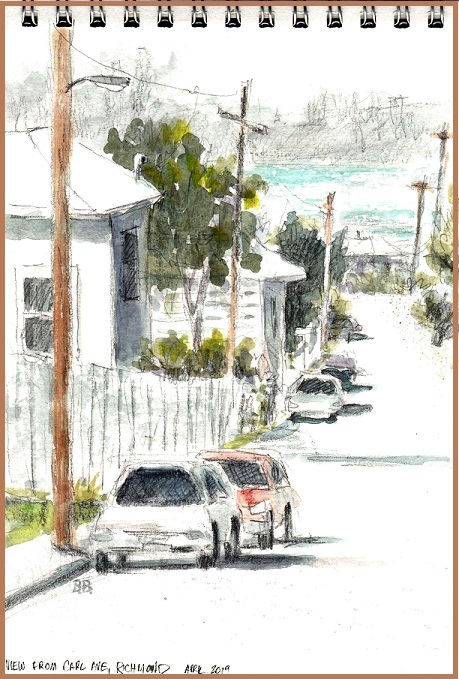 Beth's watercolors & sketches | Observations in watercolor by California artist Beth Bourland. Paintings & sketches are available for purchase. 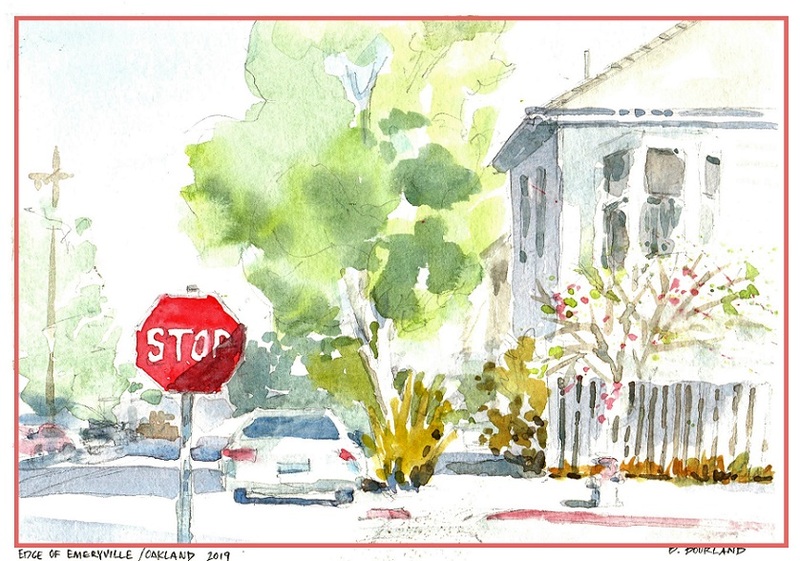 Observations in watercolor by California artist Beth Bourland. Paintings & sketches are available for purchase. As promised, I made an effort in the annual challenge of “One Week 100 people” (Google that to see examples from around the nation or world). 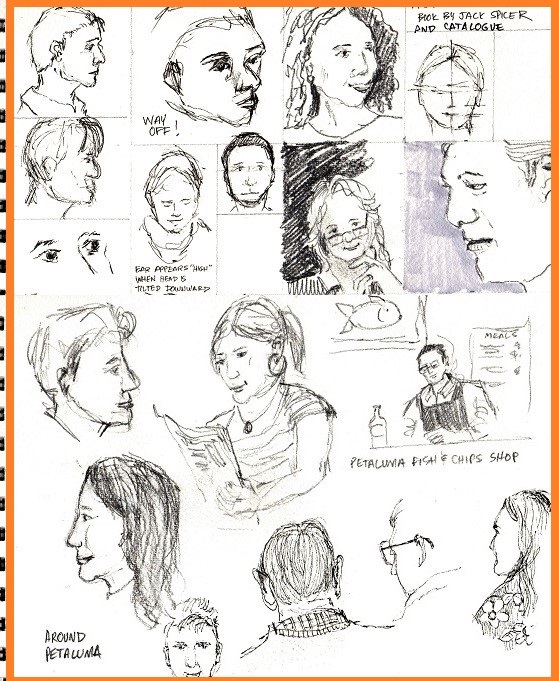 Drawing 100 people in a week is a high goal, even if the sketches are quick, or using books as a reference (any technique is encouraged). So here is my result: One Week, 21 People.” Yay!!!! 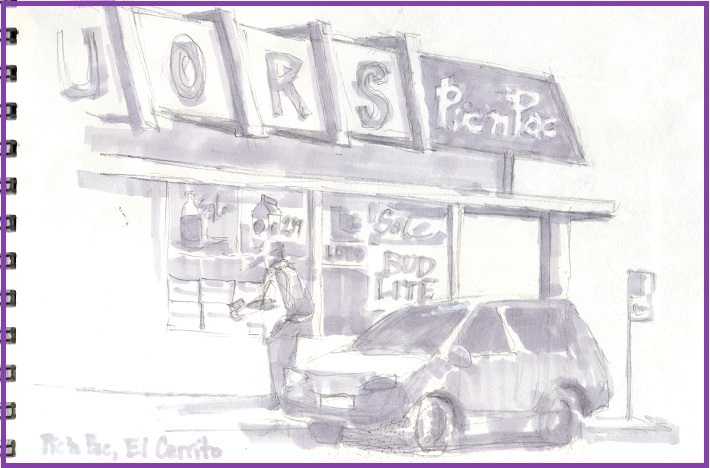 Sketched in pencil plein air, sitting in my car up on a street near the Bayview Ave. exit, Richmond. I added watercolor later. Learning & tips: I used a very limited palette and wanted to express the play of light, rather than fill everything in. I think this approach worked! It’s a fun little sketch. This is some serious fun…. If you dare! 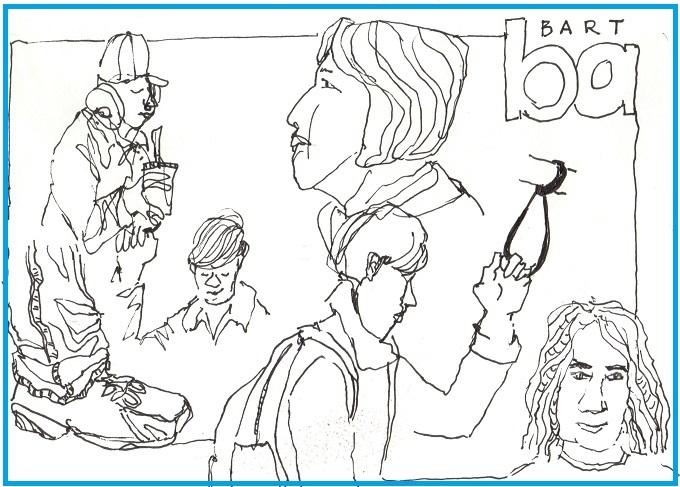 Tried some contour sketching while taking Bart to downtown Berkeley. 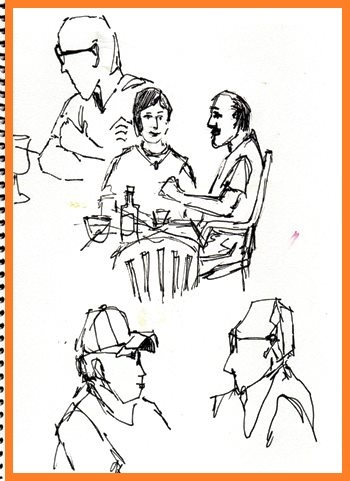 Tips: Transportation venues always have potential for sketching practice. I love kids’ art. They scribble with glee, or draw with pure confidence and joy. I just read the chapter about children’s artistic development in “Drawing on the Right Side of the Brain” by Betty Edwards. Children’s pleasure in drawing often ends about age 9 or 10, explains Edwards, as they become frustrated in their efforts or encounter harsh criticism, even ridicule. The skill sets for drawing often do not continue to progress in the way that the skills of reading or writing advance through adolescence and into adulthood. I dug out some of the few things saved from my childhood. I was influenced by the newspaper — the actual newspaper delivered in late afternoon; I remember spreading out the broad pages on the living room carpet (presumably after parents were done with it). I remember vividly the division of space – the columns of type interspersed with rectangular images. 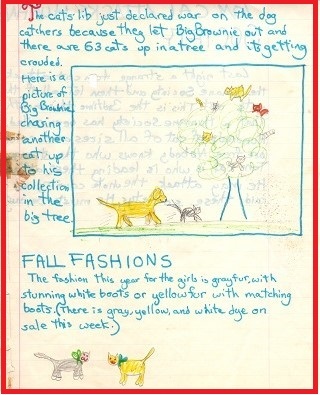 I made my own “Cat Comics” or little newspapers about animals. OMG!! In this one, I depict a dog chasing several cats up a tree. Note the resemblance to “real” newspaper style, running the type around the picture and headline: “Fall Fashions.” Also, getting all the facts: I reported that there were 63 cats up the tree. Appropriately, in the “fashion” story below, I adorned the girl cats with little bows (though there was never a bow on my head my entire childhood, I can assure you). 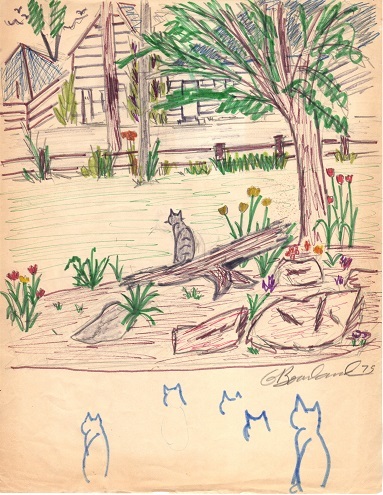 From Edwards’ book, I also see how I used typical children’s symbolism: the tree is out of proportion, but it is clearly a tree. The dog is big (menacing) and the cats have little expressions, and everything must fit in the pictorial space. To have completed these elaborate projects, I must have greatly enjoyed them, or maybe I received encouragement and praise. Here’s another drawing with typical children’s symbolism. Apparently me, in Michigan’s winter attire of hat, mittens and boots. This was done on children’s school paper with the wide lines and the dotted line in the middle for measuring letters. I apparently wrote a little story: When it is the winter time I run of The street. And I make the ice laugh with my little feeeet. Crickle crackle crickle creeet creeet creeet. 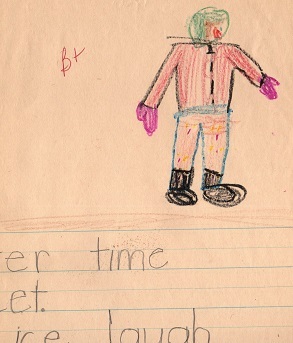 The paper is duly graded “B+” (note the teacher’s dreaded red pen). Did I actually write that story, or was it dictated? “…make the ice laugh”? If original, that is a very poetic turn of phrase, quite abstract for the apparent young age evidenced by the blocky letters. It also employed onomatopoeia – making words to represent the sounds of the ice: “creeet”. If this was original, I think I was undervalued and need to challenge this for a higher grade. 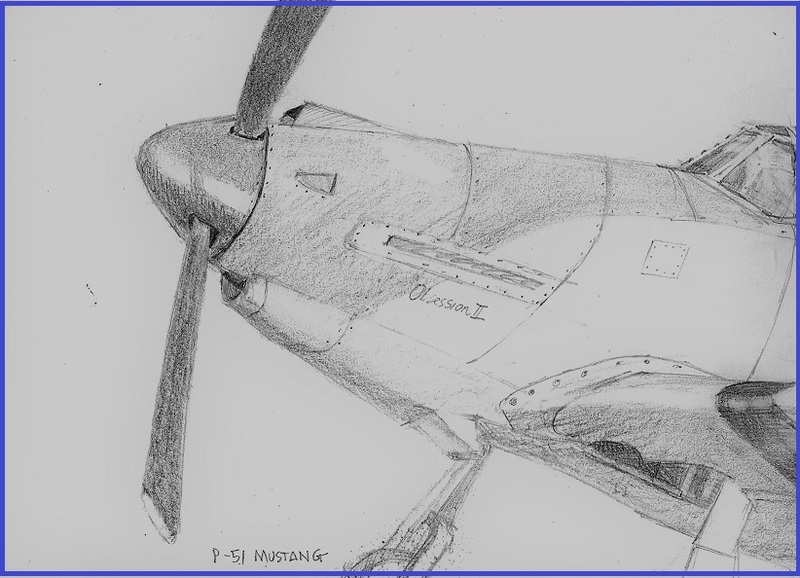 Here’s a drawing from an older age, so in my case my drawing skills continued to evolve. 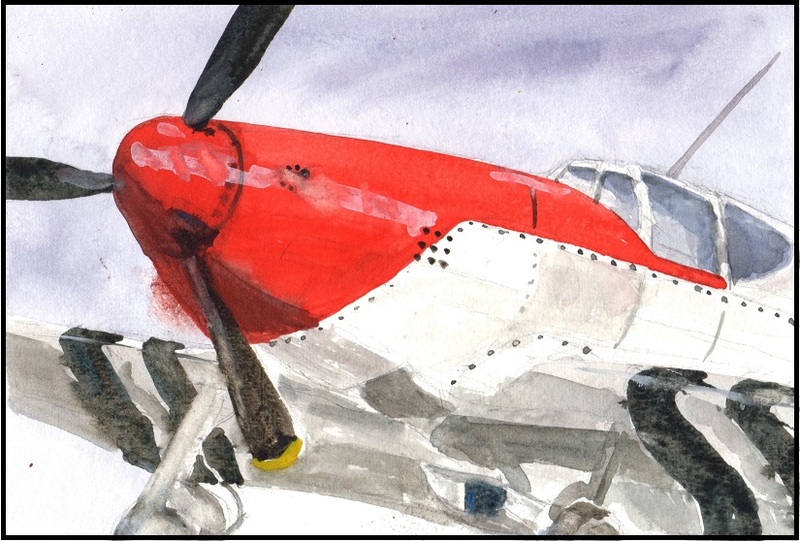 I was highly influenced by creative parents who encouraged us to draw; my dad was an amateur artist. 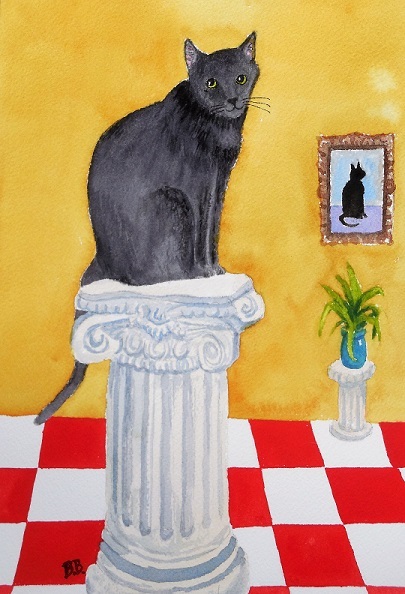 It is typical when drawing this view of a cat to neglect to depict the extra shoulder shape. I probably saw an example in a book, or maybe observed this because I often draw our cats. I even practiced this shape on the bottom of the page. This is the view from our front window, looking toward the street and the lakeside cottages (note the little cottage roof in blue at upper left; these cottages are all now gone, replaced by monster houses). In another progression of drawing, the tree is more proportional, and it’s cropped with the top not shown, instead of truncating it to fit the page. I’ve shown our rock garden with boulders and logs, and our split-rail fence. At this time, I had not progressed from the dictate that “all tree leaves are green.” To youngsters, making trees green is an attempt at “realism,” and no other color is allowed. I think the flowers are tulips. 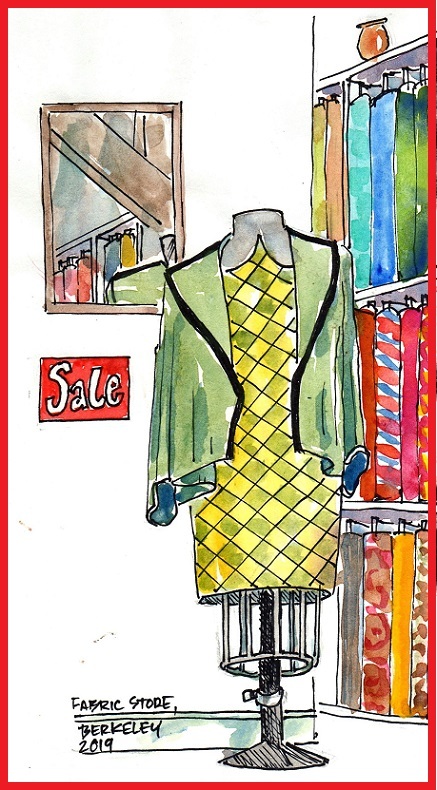 Sketched in Berkeley in pencil & ink while a friend looked for fabric to make curtains. Learning: The mirror was interesting to depict. I appreciate peaceful, ordinary places like this little neighborhood. I’m fascinated with sketching the stuff of everyday.